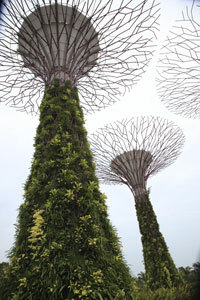 Vicky describes this amazing Singapore Garden project very well on her blog. We catch a cab down to the marina area early on Sunday morning to get into the site before the crowds. The weather is not great but the Gardens still look amazing. The first thing you see after the huge glass domes are the Supertrees. These SciFi inspired structures are still work in progress. Planted with creepers, vines, orchids and bromeliads the skeletons of the huge towers are slowly being hidden by thick green growth. 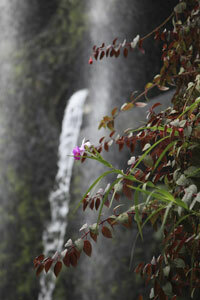 Our first stop, and our favourite, is the incredible Cloud Forest conservatory. Cooled to a chilly 23C it is dominated by a 35m high 'mountain' and kept at 80% humidity by a huge waterfall. This mimics the climate of a 'cloud forest' - tropical regions between 1000m and 3500m above sea level. A lift takes you to the top of the mountain and you can walk down exploring the plants from different levels - a Cloud Walk, Treetop Walk, and Secret Garden right down the bottom. Next door to the Cloud Forest is the Flower Dome - a 'cool dry' conservatory with zones ranging from African, Californian and South American to Mediterranean and northern European plants. Not as spectacular as the Cloud Forest Dome it still contains some remarkable plants including a fabulous collection of Baobabs and Succulents. We are put off when we walk in by a rather gaudy and tasteless display of flowers and balloons although judging by the number of people lining up to be photographed next to it we are in a minority. Apart from the headline attractions you could easily spend all day exploring the other gardens. From colonial gardens illustrating crops like rubber, coffee and pepper to China and Malay gardens through a range of educational exhibits and a marshy habitat. We finish the morning at the "Satay by the Bay" food court. Here we have satay (of course) with spicy squid and scallops with broccoli from the Chinese fish stand next door. There are a number of classier joints where you can eat but this is very tasty and good value.